Caleb grows uncomfortable with Nathan's narcissism, excessive drinking, and crude behaviour towards Kyoko and Ava. He learns that Nathan intends to upgrade Ava, deleting her memory, including interactions with Caleb, and thereby "killing" her current personality in the process. After Nathan drinks until he passes out, Caleb steals his security card to access his room and computer. He alters some of Nathan's code, discovers footage of Nathan interacting with previous android models in disturbing ways, and learns that Kyoko is also an android. Now suspicious that he may himself be an android, Caleb cuts his arm open to examine his flesh, until he bleeds profusely, thus confirming that he is human. 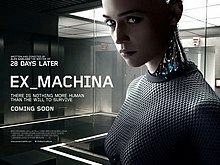 ^ "Ex Machina (2015)". Rotten Tomatoes. Fandango Media. Retrieved 2 January 2019.